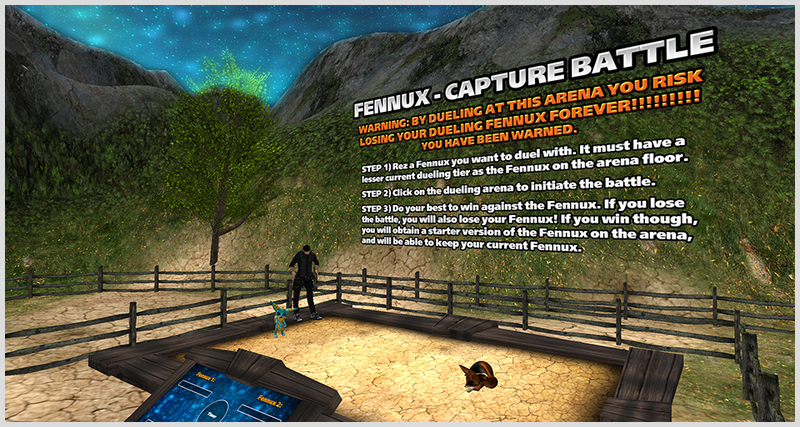 Team Fennux is proud to introduce our latest feature: Fennux Capture Battles! WARNING – YOU RISK LOSING YOUR FENNUX IF YOU LOSE THE BATTLE. IF YOU WIN THE BATTLE YOU WILL GET A COPY OF THE SAME FENNUX YOU DEFEATED TO ADD TO YOUR COLLECTION. IT WILL BE A BREEDABLE STARTER DEN WITH THE EXACT SAME STATS AS THE ONE YOU JUST DEFEATED. AGAIN, IF YOU LOSE THE BATTLE – YOUR FENNUX WILL BE ETERNAL MERGED FOR GOOD, NO EXCEPTIONS. Step 1) Rez a Fennux you want to duel with on the arena floor. It must have a lesser current dueling tier as the Fennux you are about to be battling, else you will not be able to battle the Fennux. Step 2) Click on the dueling arena to initiate the battle. Step 3) Do your best to win against the Fennux. If you lose the battle, you will also lose your Fennux! If you win the battle, you will obtain a starter version of the Fennux on the arena in DEN form, and of course you will be able to keep your current Fennux. No harm done, if you win! If you are worried about losing a Fennux with this new feature, please do not make use of this feature – or find a Fennux that you are willing to risk. The higher your Fennux’ dueling tier is, the better chance you have at defeating the Fennux at the Capture Battle Arenas. We have 5 arenas out on the sim right now, each with a different Fennux to attempt at capturing. If someone wins and obtains the Fennux, another person will have a chance to win the same type of Fennux. The only exception to this rule is if Team Fennux decides to switch up the Fennux that you battle (which we will do randomly). You may not use the same dueling tier (or better) as the current Fennux on the arena, you are required to use a Fennux that is currently at least 1 dueling tier lesser than the Fennux on the arena. For example, if we set out Dueling Tier 5 Fennux to battle, you must use 4, 3, 2, or 1 dueling tier Fennux. We highly recommend using a dueling tier that is 1 lower than whatever our Fennux is on the arenas! Thanks for reading, and happy dueling! FOR EVERY “RELAY” FENNUX WISHED IN THE WISHING WELL, TEAM FENNUX WILL DONATE L$100 TO RELAY FOR LIFE IN HONOR OF YOU! You read that correctly. Each time you drop 12 dens into the Wishing Well in exchange for a RFL 2013 “Relay” coated Fennux, our company will donate L$100 to Relay for Life. 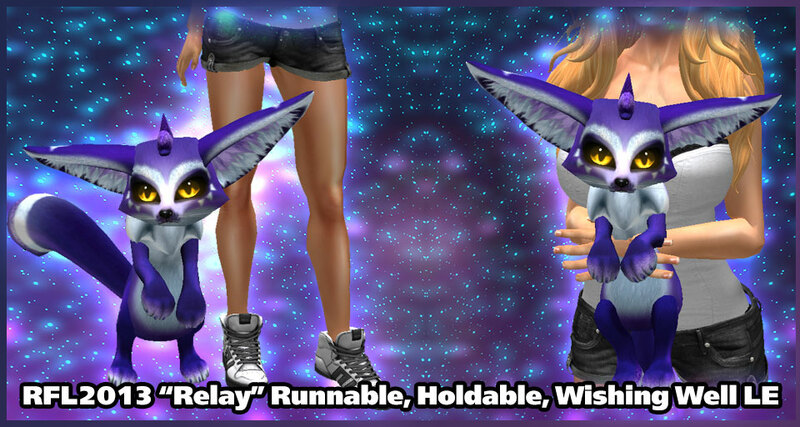 You can also purchase either the Holdable (hold in your arms) or Runnable (runs along-side you) for only L$95, and every single linden goes directly to Relay for Life. Buy as many as you want, they are transferable and only available for a limited time – and again, all proceeds go to benefit Relay for Life! And that’s all there is to it! Enjoy your RFL 2013 “Relay” LE Fennux Den, and your 12 Days of Reserve Food! WHERE DO I GET MY RFL 2013 “RELAY” LE FENNUX? The Wishing Well exists only on the Fennux Sim. We have 1 setup next to every Crafting Machine, and of course these Wishing Wells are used to turn any 12 Fennux Dens into 1 RFL 2013 “Relay” LE Den (and 12 days of Reserve Food). Yes there is a SMALL CHANCE to get “LE Spring Eyes”, but the odds are roughly about a 0.5% chance to obtain, so don’t expect to get them! The LE Spring Eyes can pass onto other coats, so even if you don’t get them from Wishing, you will have opportunities to obtain them in the Secondary Market later. If you don’t know what the Spring Eyes look like – please visit this post here and view the right side of the main image. Most Fennux however will have regular eyes from a starter den, very similar to Crafting – the only thing that is “LE” on most RFL 2013 “Relay” LE Fennux is the over-ride of the Fennux Coat. It’s more-or-less exactly like Crafting, except for the fact the coat will not pass. Hey everyone! We got invited to take part in the May 2013 Collabor88 Event in Second Life, so we decided to make a couple limited edition items just for the occasion. 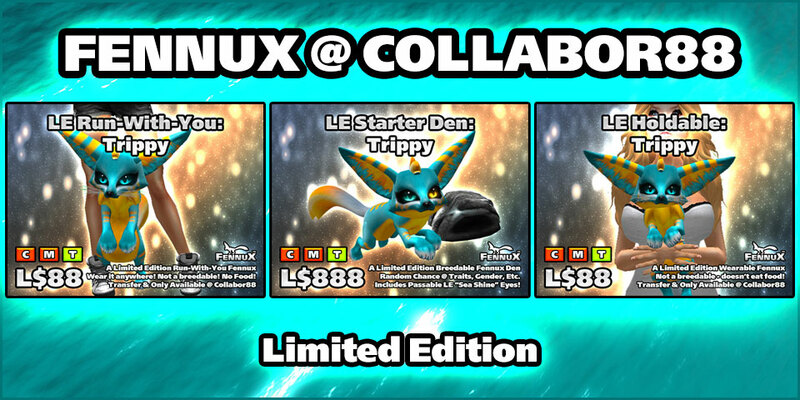 We have included some items for only L$88/ea, as well as a Limited Edition Fennux Starter Den for only L$888 (in honor of Collabor88). A non-breedable Fennux that is attached only to “Right Hand”, allowing you to carry it around attached to your avatar anywhere in Second Life. Transfer permission and only available at Collabor88 this month. A non-breedable Fennux that is attached only to “Avatar Center”, allowing you to run around with it attached to your avatar anywhere in Second Life. Transfer permission and only available at Collabor88 this month. A breedable starter den with random chance at traits, gender, etc. Includes passable “Sea Shine” eyes! Transfer permission and only available at Collabor88 this month. These will be made available from May 8th until the end of the month, so if you are unable to get into the event right away – you’ve got plenty of time to get there over time. Thanks for reading, and enjoy the Trippy coat. The Nightlight Limited Edition Fennux Coat is here! And that’s all there is to it! Enjoy your Nightlight LE Fennux Den, and your 12 Days of Reserve Food! WHERE DO I GET MY NIGHTLIGHT LE FENNUX? The Wishing Well exists only on the Fennux Sim. We have 1 setup next to every Crafting Machine, and of course these Wishing Wells are used to turn any 12 Fennux Dens into 1 Nightlight LE Dens (and 12 days of Reserve Food). Most Fennux however will have regular eyes from a starter den, very similar to Crafting – the only thing that is “LE” on most Nightlight LE Fennux is the over-ride of the Fennux Coat. It’s more-or-less exactly like Crafting, except for the fact the coat will not pass. The Wishing Well has recently been upgraded to have a couple of new and exciting features. In the event you try dropping in 12 of the same Ears, and/or Hair, and/or Tail, and/or Whiskers, and/or Eyes, and/or Gender, and/or Aggression, Dueling Tier, Max Size, Tier Level of Region (T1s, T2s, T3s, etc), Region – you will receive that exact same type of Fennux in return as a Wishing Well Limited Edition! So if you’ve ever wanted to have an LE with Clipped Ears or maybe Cat Tail, you can guarantee that whatever LE comes out will at least have Clipped Ears or Cat Tail. This works with multi-traited Fennux as well. THE KEY PART TO REMEMBER: YOU MUST DROP IN THE SAME TRAITED DEN ON EVERY WISHING WELL SLOT, OR THE SAME COATED DEN ON EVERY SLOT, OR THE SAME TIER LEVEL ON EVERY SLOT, ETC – OTHERWISE YOU WILL NOT GET “BETTER CHANCES” IF YOU ARE USING PARTIAL “INGREDIENTS”. YOU MUST USE 12 OF THE SAME TYPE OF FENNUX TO GUARANTEE IT COMING BACK OUT THE SAME. If you put in 12x T2 Fennux (a mixture of Foxy, Sneaky and Stripes for example), you will be guaranteed to get a random region T2 LE in exchange. If you put in 12x T2 Foxy Fennux (all Foxy, no other T2s), you will be guaranteed to get a T2 Western LE in exchange, so if you were trying to “mix it up” and get a different region besides a T2 Western LE – you must at least put 1 other type of T2 into the mixture. If you put in 6x T2 Foxy with short hawks, and 6x T2 Foxy with No Hair, you will be guaranteed to get T2 Western LE in exchange with No Hair – short hawk is still possible but it’s not to be expected. Adding partial short hawks does not aid in your ability to get guaranteed short hawks out on the LE Den, only 12 of the same type of trait will trigger this new feature. If you put in 12x T2 Foxy with short hawks, expect a T2 Western LE with Short Hawk in exchange. If you put in 6x T2 Foxy with Short Hawks, and 6x T2 Foxy with Wolf Tail, expect a T2 Western LE with no traits at all. It’s possible to get SOME traits still, but adding partial short hawks and wolf tail does not aid in your ability to get a short hawk + wolf tail Fennux. Some might ask “Is it possible to drop in a mixture of T3 Antlers and T3 Kenyas to attempt at getting a T3 Polar LE, T3 Eastern LE or T3 Amazon LE?” …and yes it is possible for this to happen – so long as you put 12x T3 into the Well and you make sure they are NOT all the same region, but do know that it’s also possible to get a T3 Saharan LE or T3 Western LE in exchange for 12 of them even if you mix up the regions, as Western and Saharan regions are always more populous than Polar, Eastern and Amazon. Please understand that only discovered content is available from the Wishing Well – you cannot put in a mixture of T4 Fennux (in the future) in hopes of discovering the first T4 Amazon – it just doesn’t work in that way. Also, the only way to obtain a Mystery Region Fennux is to use 12x of them dropped into the well. How ever these present features of wishing well will continue to work: Where ever there can be a T1 LE – there will be a slight chance at it being T2 LE. Where ever there can be Normal ears – there will be a slight chance at it being Wolf Ears. Where ever there can be Normal Tail – there will be a slight chance at it being Wolf Tail. Where ever there can be No Hair – there will be a slight chance at it being Short Hawk. But If you want these to be guaranteed upgradation, then follow the instructions above and choose your dens accordingly. A slight chance at a wishing-well-only special eye will also continue to exist. I hope these examples clarify how our new Wishing Wells work, if you have any questions feel free to ask in The Fennux Group Chat. Of course you can always click the following link to visit the Official Fennux Sim. Team Fennux is hosting a 100% Free Hunt @ The Fennux Sponsor Sims! NOTE FROM DAEMON: I’ve noticed sometimes I have to click the sponsor image 2 TIMES before it correctly takes me to the desired location, so please click once, wait a few seconds for the Map to show up, then click a second time on the same image to get the proper location – and THEN click teleport. All you need to do is visit one of the sponsor sims, go to The Fennux Sponsor Display and click the sign that says “Spring Hunt” to obtain your Free Spring Hunt HUD. Then you can simply follow along in any order to hunt down all 12 Free Fennux Collectables! Please don’t simply go from left to right, try clicking random sponsor images on the HUD. Each time you are on a sponsor sim a blue bar will highlight underneath the sponsor image, helping you know exactly where you are. You will also notice the red circles above the sponsor images turn green each time you have found one of the hunt items. So what do the hunt items look like? Please examine the photo above, you will notice a sparkly green Fennux Den, this is what you are looking for at each sponsor display area. So what are you waiting for? Get over to a sponsor sim RIGHT NOW (click one of the bottom sponsor image links) to get your Free Spring Hunt HUD, so you can get to collecting all 12 items! NOTE: Every item in this hunt is Copy / No-Modify / No-Transfer. The Easter 2013 Limited Edition Fennux (Eggy, Meadow and Chicky) are here! NOTE: THE LE SPRING EYES SEEN ABOVE ARE VERY RARE, DO NOT EXPECT TO GET THEM, BUT IF YOU DO GET THEM – CONGRATULATIONS! And that’s all there is to it! Enjoy your Easter LE Fennux Den, and your 12 Days of Reserve Food! WHERE DO I GET MY EASTER LE FENNUX? The Wishing Well exists only on the Fennux Sim. We have 1 setup next to every Crafting Machine, and of course these Wishing Wells are used to turn any 12 Fennux Dens into 1 of the 3 Easter LE Dens (and 12 days of Reserve Food). Yes there is a SMALL CHANCE to get “LE Spring Eyes”, but the odds are roughly about a 0.5% chance to obtain, so don’t expect to get them! The LE Spring Eyes can pass onto other coats, so even if you don’t get them from Wishing, you will have opportunities to obtain them in the Secondary Market later. If you look at the example picture above, the Fennux on the far right is sporting LE Spring Eyes. Most Fennux however will have regular eyes from a starter den, very similar to Crafting – the only thing that is “LE” on most Easter LE Fennux is the over-ride of the Fennux Coat. It’s more-or-less exactly like Crafting, except for the fact the coat will not pass. This is an important announcement to aid in reassuring users that The Fennux Breedable is attempting to meet the needs of the Fennux breeders by addressing a sizable concern over the topic of Tier Upgradation. We have gotten a good amount of feedback from users recently showcasing example trees that have upgraded in an odd manner (T1 + T1 = T3 [that had only one t2 in the background]). At face value this is obviously a bad thing, as people start to think “hey, we don’t need T2 or T3 to get T3, T1 works great!” – which is not the case, as these examples happened 2 times ever, but it’s better for us to address this now than later. We too agree with the breeders as these occasional oddities may not be good for the economy, and they help spread rumors, so we have since made a few minor tweaks to avoid those oddities in the future, and have made sure that “higher purity tree upgradations” are more beneficial than before, effectively enhancing the breeding skill end of the spectrum. (breeding skill based on our breeding guide shown here: http://www.fennux.com/breeding-info). From now on there won’t be any crazy “Double Jump Upgradations” happening. For example, we have seen 2 cases (out of hundreds of thousands of examples) where a pair of T1 Fennux have made a T3 (with only one T2 in the background). This sort of thing is now eliminated from occuring. We are not saying that you must breed for pures to succeed, we have not changed our code so much that it’s eliminating any sort of breeding strategies, we’re merely enhancing one strategy that has been recommended to users by us on the Breeding Info Page since it’s inception. Keep in mind this will not be an instant change, mainly because it takes 5 days for a pair of Fennux to breed, and no we did not drastically change the breeding code so that all pure T2 Fennux will start popping out T3 in such a manner that causes issues with the secondary market (flooding), it’s very minor yet will be surprisingly helpful. It is nice to randomly get something good out of nowhere, but we feel this should not be a key part of the actual breedable game, we like to reserve luck/chance for other areas such as (Wishing, Crafting, etc. ), while enhancing the skill aspect of the breedable. Obviously we do not guarantee your success with every single breeding outcome after the addition of our slight tweaking, but we expect that you will find your Fennux and other people’s Fennux to be more successful in upgrading tiers from this point forward. Further Clarification: Please understand that this is not “killing the value of offspring”, as offspring will still be just as beneficial as before (only two users will notice a difference in offspring breeding, as only two users ever had something crazy like a double jump happen). Something like T1 + T1 = T2 is still possible with a T2 in the background, but something like T1 + T1 = T3 is not possible with just a T2 in the background, as it’s seen by most as too much of a reward. If you want a chance at T3 coming out from offspring, make sure there is T3 involved somewhere, and the more the better. Our algorithm needs to think you are trying to make T3, or trying to make T2 before it starts to give you that ability, and something like T1 + T1 with T2 in the background is not telling our algorithm that you want T3, it’s telling it you want T2 at best. We want to thank each and every user for their understanding, and of course thank the users who have provided us such feedback to help with decision making. Happy breeding! The March 2013 St. Patrick’s Day Limited Edition Fennux (Lucky Coat) is here! And that’s all there is to it! Enjoy your Lucky LE Fennux Den, and your 12 Days of Reserve Food! WHERE DO I GET MY LUCKY LE FENNUX? The Wishing Well exists only on the Fennux Sim. We have 1 setup next to every Crafting Machine, and of course these Wishing Wells are used to turn any 12 Fennux Dens into 1 Lucky LE Den (and 12 days of Reserve Food). No, this Fennux does not have LE Eyes, it has regular eyes from a starter den, very similar to Crafting – the only thing that is “LE” on the Fennux is the over-ride of the Fennux Coat. It’s more-or-less exactly like Crafting, except for the fact the coat will not pass. The Valentine’s Day Limited Edition Fennux are here! And that’s all there is to it! Enjoy your Valentine’s LE Fennux Den, and your 12 Days of Reserve Food! WHERE DO I GET MY VALENTINE’S LE FENNUX? The Wishing Well exists only on the Fennux Sim. We have 1 setup next to every Crafting Machine, and of course these Wishing Wells are used to turn any 12 Fennux Dens into 1 Valentine’s LE Den (and 12 days of Reserve Food). No, these do not have LE Eyes, they have regular eyes from a starter den, very similar to Crafting – the only thing that is “LE” on the Fennux is the over-ride of the Fennux Coat. It’s more-or-less exactly like Crafting, except for the fact the coat will not pass.